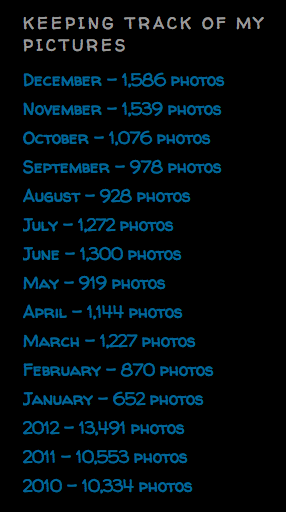 Another successful year in my daily photo project. I had more pictures this year than the last 3 years, and I know why! A full year with my iPhone, Instagram, family pictures for some of my friends, lots of traveling, Ellen & Georgia, and a goal to become a better photographer. I plan to continue this project for the fifth year ... I love the challenge of finding something to photograph each and every day. It's becoming harder and harder to pick a favorite picture to share on the blog, but that's a nice problem to have. I'll update the banner soon ... I'm doing good at this point just to have my photos uploaded from the holidays. Add my site to your favorites, and continue to come back and see my daily photos. Thanks for all your encouragement and positive words when it comes to my photographs ... it all means the world to me! Great job on your blog! I've enjoyed looking at it over the past four years and watching you grow as a photographer. Siiiiiiittttt ... Waaaiiitttt ... OK! Whoooo knew these were hiding on my desk?